Blue Imp's increasingly popular IMPulse Outdoor Fitness stations are designed to provide a complete work-out and are manufactured in Canada for maximum performance in weather extremes. Each station comes complete with instructional signage for safe, effective usage. Encouraging exercise and movement in older children can sometimes be a bit difficult, however, with Blue Imp's challenging agility products and Dynamo's innovative net structures, even the teens will be having so much fun they will soon forget that they are getting a great workout! Blue Imp's IMPulse Fitness Stations are designed and crafted in Canada with fewer moving parts, and more opportunities for calisthenics - having the users' body weight providing the resistance. Getting fit in the great outdoors has never been so much fun and convenient! Parkour and calisthenics are a growing trend in fitness, especially attractive to the tween and teen aged children. Keeping them active through courses such as Blue Imp's FreeZone is fun and challenging and the results are nearly limitless. Our Blue-kour Series courses can be fully customized to fit your space. 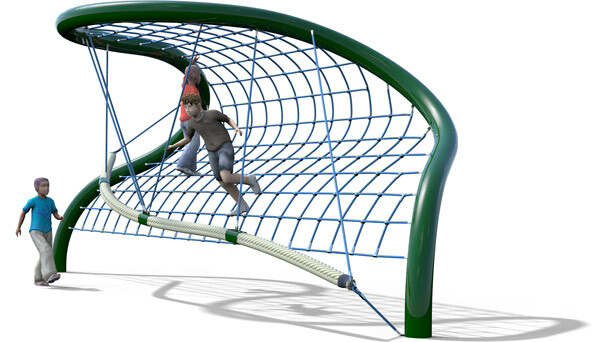 Our rope courses come in various shapes and sizes, and can be included with various activities. These can be utilized for many applications including a community fitness initiative or even a physical education class! The sky is truly the limit with possibilities here! Contact your BDI Play Designs representative for more information!